Michelangelo was highly respected for his artistic talents and was assigned for many different jobs by influential men like the pope and others. Michelangelo di Lodovico Buonarroti, renaissance painter, sculptor, architect, poet and engineer, is one of the greatest artists of all time. When he was a baby his mother was too weak to nurse him so he was placed with a wet nurse and at the age of 6 his mother died. He was born as the second of five brothers. All of his childhood life he didn't get much love and affection and became touchy and kept to himself. As an adult He wasn't an easy person to be around and many sources refer to his rude manners and complicated character. He had often difficulties in the relations with other people and never had pupils or worked in collaboration with others. His incompetents to socialise is believed to depend on his childhood. Even so, unlike many artists of his time, he was highly respected for his genius and artistic talents and was assigned for many different jobs by influential men like the pope and others. He is also the first western artist whose biography was published while he was alive. He is the best documented artist of the 16th century. His father sent him to study grammar at a very early age but Michelangelo was more interested in drawing and being with artists. At age 13 he told his father he wanted to become an artist and that he had agreed to become an apprentice in the workshop of the painter Domenico Ghirlandaio in Florence. His father had hoped him to become a successful merchant or businessman one day and was not at all happy about his choice. But the talented young man followed his passion. After one year of learning the fresco technique at Domenico Ghirlandaio's workshop, he attended the Medici school under the patronage of Lorenzo de' Medici, the Magnificent (Medici was a political dynasty, banking family and later also royal house). Here he discovered his talent for sculpturing. Lorenzo had gathered lots of different kind of people around him like poets, neo platonic philosophers, artists and other learned men who influenced young Michelangelo a lot. Michelangelo was very interested in the human body, especially the male body. To be able to really understand human anatomy he wanted to make studies of corpses. This was strictly forbidden by the church and to be able to make these studies he bribed the prior of the church of Santo Spirito by giving him a wooden Crucifix, made by Michelangelo himself. Because of him studying anatomy so closely he was able to depict the human body in such an incredible way, both in his painting and sculptures. I felt as old and as weary as Jeremiah. I was only 37, yet friends did not recognize the old man I had become." Being a multi talented man, a true archetype for the renaissance man, he was also working as an architect. In the 1520s he designed the Laurentian Library and its elegant entrance hall. Like with his sculpturing, he expresses himself very personal, refusing to follow the Greek and Roman architecture style. He also designed the remodelling of the buildings surrounding the "Campidoglio" and parts of the "St. Peter's Basilica" both in Rome. His talent for poetry is shown in his many poems and sonnets written for Vittoria Colonna. They had a very deep friendship and met when Michelangelo was an older man in his sixties and she was only in her forties. All his life he was active in both Florence and Rome. He and Leonardo da Vinci where contemporary artists at the time and lived and worked in the same area. They didn't like each other at all though. 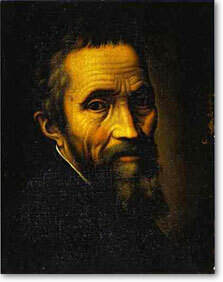 Michelangelo lived a long life and many of his friends died before him. The last years he couldn't sleep at night so he stayed up working on sculptures. He also was very lonely. Before he died he unfortunately burned much of his artistic material. He was first buried in Rome, but later his nephew moved him to Florence and buried him in Santa Croce, which was his last wish. Remodeling of the buildings surrounding the "Campidoglio"